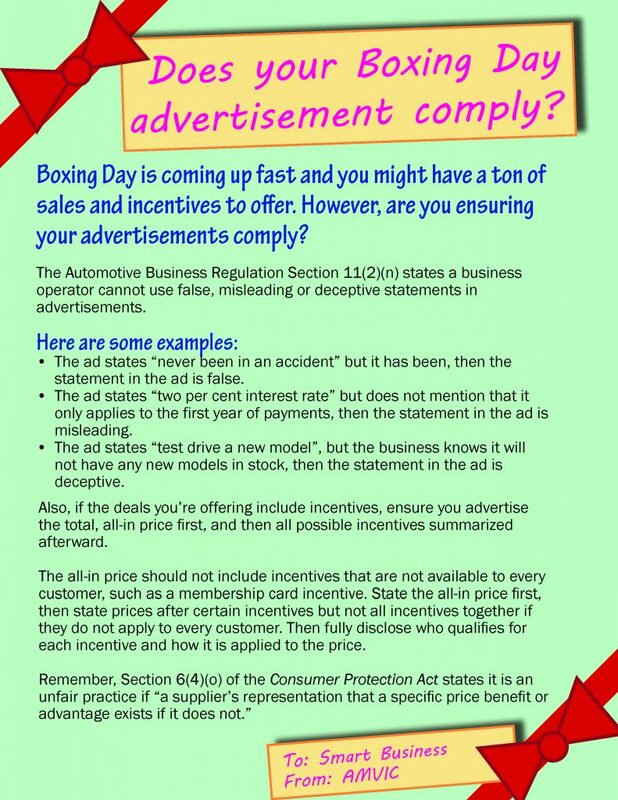 Does your Boxing Day advertisement comply? Boxing Day is coming up fast and you might have a ton of sales and incentives to offer. However, are you ensuring your advertisements comply? The Automotive Business Regulation Section 11(2)(n) states a business operator cannot use false, misleading or deceptive statements in advertisements. The ad states “never been in an accident” but it has been, then the statement in the ad is false. The ad states “two per cent interest rate” but does not mention that it only applies to the first year of payments, then the statement in the ad is misleading. The ad states “test drive a new model”, but the business knows it will not have any new models in stock, then the statement in the ad is deceptive. Also, if the deals you’re offering include incentives, ensure you advertise the total, all-in price first, and then all possible incentives summarized afterward. The all-in price should not include incentives that are not available to every customer, such as a membership card incentive. State the all-in price first, then state prices after certain incentives but not all incentives together if they do not apply to every customer. Then fully disclose who qualifies for each incentive and how it is applied to the price.